WASHINGTON, DC – The National Reverse Mortgage Lenders Association reports today that an estimated $147 billion increase in the aggregate value of homes owned by seniors drove their share of home equity to $5.76 trillion and rocketed the NRMLA/RiskSpan Reverse Mortgage Market Index (RMMI) to an all-time high in Q3 2015 of 200.19 from 195.42 in Q2. Mortgage debt held by seniors increased slightly from $1.45 trillion to $1.46 trillion last quarter, but the uptick was barely a dent in home equity levels, which have climbed steadily for 18 consecutive quarters. 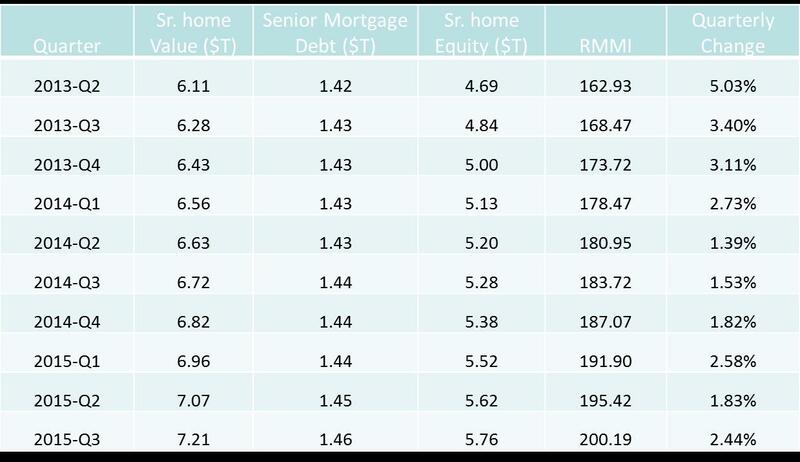 The Q3 numbers are based on a revised methodology that includes data from the 2013 American Community Survey and the Federal Reserve’s Z.1 Release to estimate the value of aggregate senior home equity underlying the RMMI. “The recalibrated index uncovered something we didn’t expect to see, which was that senior housing values outperformed the general population. In metro areas hard hit by the Great Recession, for example, senior home values were more resilient to declines. It’s great news for seniors who are considering tapping their housing wealth to support their retirement planning,” said NRMLA President and CEO Peter Bell. The changes in methodology and data source updates resulted in a very significant 37% increase in the aggregate value of senior equity.